You are here: Home / Procurement Insights / Are your major services contracts strangling your business? Wish to use this image? It is free to share as long as a link back to acquireprocure.com is included wherever it is published. The other day, a company mentioned that their major supply contract for services was strangling them and they felt paralyzed to change it. When they explained what had happened, you didn’t need to be rocket scientist to see that the rush to bundle up the businesses activities and outsource it had left them vulnerable. 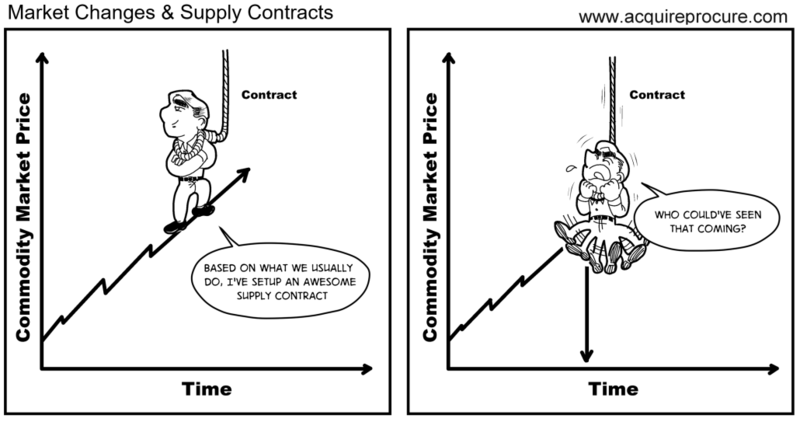 Often businesses only include price escalation calculations in their contracts, they forget that prices do go down and they should also be able to adjust the price when the market corrects. 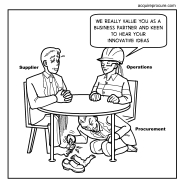 Some KPI’s, specifically in large services contracts, can be achieved but the contract is a commercial failure. Be sure to align the KPI’s with the value that the contract is expected to generate for the business and not some nominal data. Many companies like having a Termination for Convenience clause in their contract as this gives them the ability to cancel the contract when the market changes. This can work well in some case but it can often come at a significant cost as suppliers will build the risk of this clause being invoked into their costs. Instead, consider a number of scenarios with suppliers to better manage the risk if the market changes. 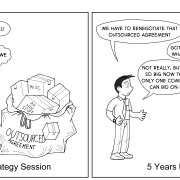 If you are feeling like your large services contract is strangling your business, please don’t hesitate to contact us. Find out how to unlock value in an troublesome supply arrangement.